Beginner and veteran stitchers confuse needlepoint and petit point. Even the terms "needlepoint" and "petit point" (sometimes spelled "petite point") are often used interchangeably, but they are very different. It’s important to know the difference between the two, especially when purchasing needlepoint kits online or at a craft store. If you are a beginner or casual stitcher, you might mistakenly buy a kit for petit point, all the while thinking you are getting a simple needlepoint design. To avoid situations like this, it's important to know their similarities and differences and then use this knowledge to make more informed buying and stitching choices. What Do Needlepoint and Petit Point Have in Common? Both needlepoint and petit point are types of canvas embroidery. They are both worked on even-weave needlepoint canvas instead of tightly woven fabric with a blunt-tipped tapestry needle. Exquisite hand-worked items can be made with both types of embroidery, creating some of the loveliest needlework ever stitched. How Do Needlepoint and Petit Point Differ? Petit point is always comprised of tiny, beautiful stitches worked on individual threads of Penelope canvas or fine mesh needlepoint canvas (22 or more threads to the inch) like Congress Cloth or silk gauze. In addition to canvas embroidery, the petit point also has been used to describe very fine work in cross-stitch designs. Although needlepoint can be worked on Penelope canvas as well, most stitchers prefer to use single-thread or mono canvas because of the larger stitches and heavier thread used to work the average needlepoint project. How is Petit Point Worked? Petit Point is worked using tiny tent needlepoint stitches, which allow a stitcher to create greater detail in a particular area of a needlepoint design. That's why it is stitched on double-thread canvas. For example, mono or single thread canvas allows for (1) stitch worked over a vertical and horizontal mesh intersection; which normally would be too large for petit point (unless using the finer mesh sizes). 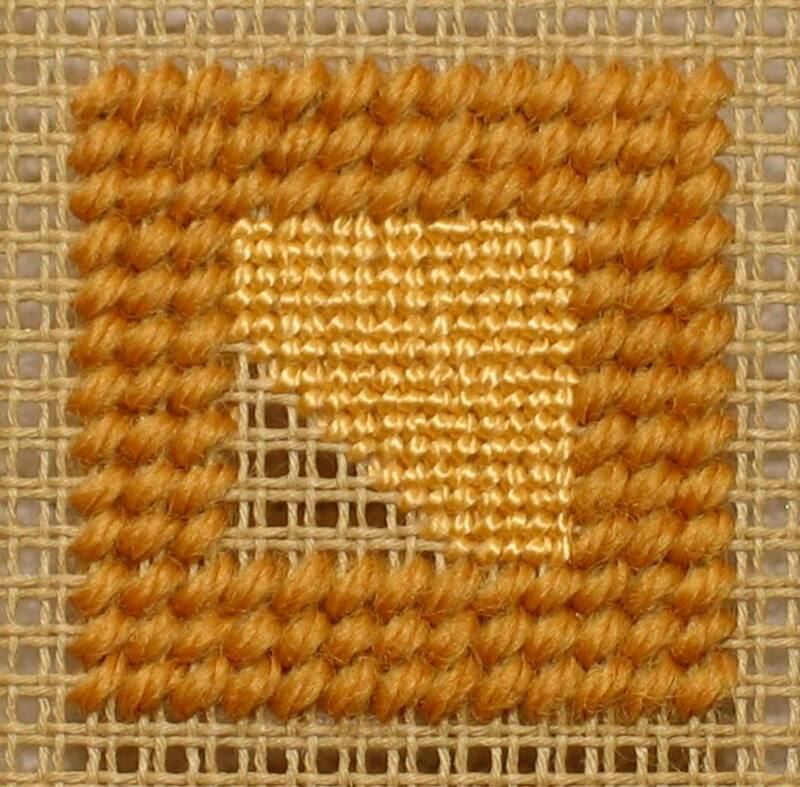 On the other hand, an intersection of Penelope canvas can accommodate (4) smaller petit point stitches. Take a look at the example in the image. The petit point is worked over single threads in the center area, versus standard needlepoint worked in the border area. If possible, you should make petit point stitches with the canvas stretched tautly and mounted in a frame. That way, you'll be better able to separate the mesh intersections equally without pulling the surrounding ones out of shape. When working a project, both petit point and needlepoint can be stitched on the same piece of canvas as long as it is Penelope canvas. When regular needlepoint stitches are made alongside petit point stitches, they are called "Gros Point." Many machine-stamped and printed needlepoint designs typically found in kits use both petit point and gros point, and famous needlepoint designers offer projects that are exclusively worked on Penelope canvas using both techniques. Whenever you require a lot of detail in a needlepoint design you have created, you should choose Penelope canvas. If you decide to work both petit point and gros point on the same canvas, choose tapestry needles carefully in sizes that fit the needlepoint canvas you are using. Select threads and fibers with multiple plies for their effectiveness in working both petit point and gros point stitches. Sometimes when working gros point along with the petit point in a project, it's easy to forget where to place a stitch. To keep this from happening, work as many of the petit point areas in the project first and then complete the rest of the pattern with the gros point.